www.isola-group.com/RF RF/Microwave Materials & Resources ► IS680 materials offers a complete laminate materials solution for single- and double-sided printed circuit designs and is a cost-effective alternative to PTFE and other commercial microwave materials. ► I-Tera ® MT RF materials are available in 0.010", 0.020" and 0.030" in 3.38, 3.45 and 3.56 Dk. ► I-Tera ® MT materials are suitable for both high-speed digital and RF/ microwave designs. A full compliment of cores and prepregs allowing flexibility in design is available in core thicknesses from 0.002" to 0.018". RF/MICROWAVE MATERIALS IS680 I-Tera ® MT RF I-Tera ® MT TerraGreen ® Astra ® MT Tg 200°C 200°C 200°C 200°C 200°C Td 360°C 360°C 360°C 390°C 360°C Dk @ 10 GHz 2.80 - 3.45 3.38, 3.45 & 3.56 3.45* 3.45* 3.00 Df @ 10 GHz 0.0028 - 0.0036 0.0028, 0.0031 & 0.0034 0.0031* 0.0030* 0.0017 CTE Z-axis (50 to 260°C) 2.90% 2.80% 2.80% 2.90% 2.90% T-260 & T-288 >60 >60 >60 >60 >60 Halogen free No No No Yes No VLP-2 (2 micron Rz copper) Available Available Available Standard Standard Stable Dk & Df over the temperature range -55°C to +125°C -55°C to +125°C -55°C to +125°C -55°C to +125°C -40°C to +140°C Optimized global constructions for Pb-free assembly Yes Yes Yes Yes Yes Compatible with other Isola products for hybrid designs For use in double- sided applications Yes Yes Yes Yes Low PIM < -155 dBc Yes Yes Yes Yes Yes * Dk & Df are dependent on resin content NOTE: Dk/Df is at one resin %. Please refer to the Isola website for a complete list of Dk/Df values. The data, while believed to be accurate & based on analytical methods considered to be reliable, is for information purposes only. Any sales of these products will be governed by the terms & conditions of the agreement under which they are sold. ► TerraGreen ® halogen-free, very low-loss, thermoset materials are available in a variety of laminate and prepreg offerings. This material is inexpensive to process – improving your company's bottom line, as well as the environment. ► The revolutionary Astra ® MT ultra low-loss thermoset laminates are a replacement for PTFE. These materials have been used for hybrid applications with Isola's 185HR and 370HR products. 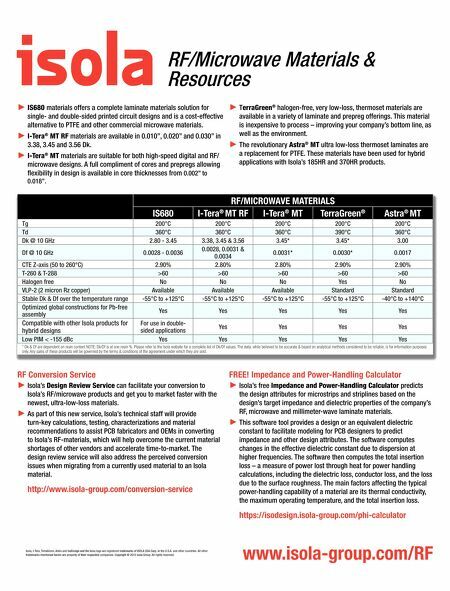 RF Conversion Service ► Isola's Design Review Service can facilitate your conversion to Isola's RF/microwave products and get you to market faster with the newest, ultra-low-loss materials. ► As part of this new service, Isola's technical staff will provide turn-key calculations, testing, characterizations and material recommendations to assist PCB fabricators and OEMs in converting to Isola's RF-materials, which will help overcome the current material shortages of other vendors and accelerate time-to-market. The design review service will also address the perceived conversion issues when migrating from a currently used material to an Isola material. http://www.isola-group.com/conversion-service FREE! Impedance and Power-Handling Calculator ► Isola's free Impedance and Power-Handling Calculator predicts the design attributes for microstrips and striplines based on the design's target impedance and dielectric properties of the company's RF, microwave and millimeter-wave laminate materials. 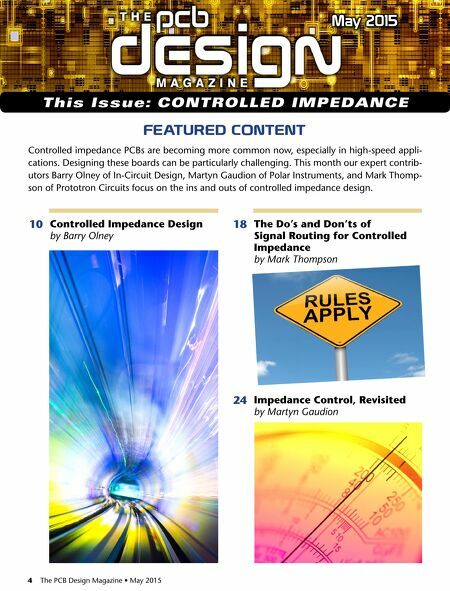 ► This software tool provides a design or an equivalent dielectric constant to facilitate modeling for PCB designers to predict impedance and other design attributes. The software computes changes in the effective dielectric constant due to dispersion at higher frequencies. The software then computes the total insertion loss – a measure of power lost through heat for power handling calculations, including the dielectric loss, conductor loss, and the loss due to the surface roughness. The main factors affecting the typical power-handling capability of a material are its thermal conductivity, the maximum operating temperature, and the total insertion loss. https://isodesign.isola-group.com/phi-calculator Isola, I-Tera, TerraGreen, Astra and IsoDesign and the Isola logo are registered trademarks of ISOLA USA Corp. in the U.S.A. and other countries. All other trademarks mentioned herein are property of their respective companies. Copyright © 2015 Isola Group. All rights reserved.